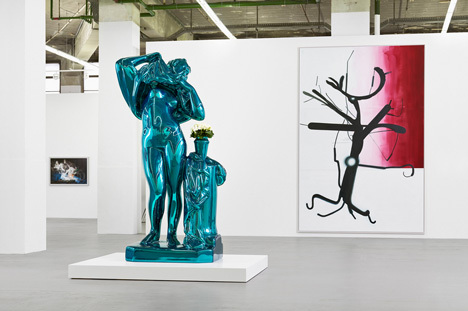 On the occasion of the 40 years anniversary of the gallery, Max Hetzler and Samia Saouma will present a particular exhibition featuring recent works by all the gallery artists: Darren Almond, Glenn Brown, André Butzer, Rineke Dijkstra, Günther Förg, Mona Hatoum, Jeff Koons, Vera Lutter, Marepe, Beatriz Milhazes, Ernesto Neto, Frank Nitsche, Albert Oehlen, Yves Oppenheim, Richard Phillips, Michael Raedecker, Bridget Riley, Thomas Struth, Rebecca Warren, Christopher Wool and Toby Ziegler. It will be the final exhibition in the current gallery space at Oudenarder Straße in Berlin-Wedding. A book entitled REMEMBER EVERYTHING : 40 Years Galerie Max Hetzler will be published by Holzwarth Publications, Berlin and Ridinghouse, London. Edited by Jean-Marie Gallais, this publication will document exhibitions held at the gallery since 1974, gathering conversations with the artists along with archive images.